NASA’s Cassini spacecraft has provided the first direct evidence of small meteoroids breaking into streams of rubble and crashing into Saturn’s rings. These observations make Saturn’s rings the only location besides Earth, the Moon and Jupiter where meteor impacts have been observed as they occur. The meteoroids at Saturn are estimated to range from about one-half inch to several yards (1 centimeter to several meters) in size. Results from Cassini have already shown Saturn’s rings act as very effective detectors of many kinds of surrounding phenomena, including the interior structure of the planet and the orbits of its moons. For example, a subtle but extensive corrugation that ripples 12,000 miles (19,000 kilometers) across the innermost rings tells of a very large meteoroid impact in 1983. The Saturnian equinox in summer 2009 was an especially good time to see the debris left by meteoroid impacts. 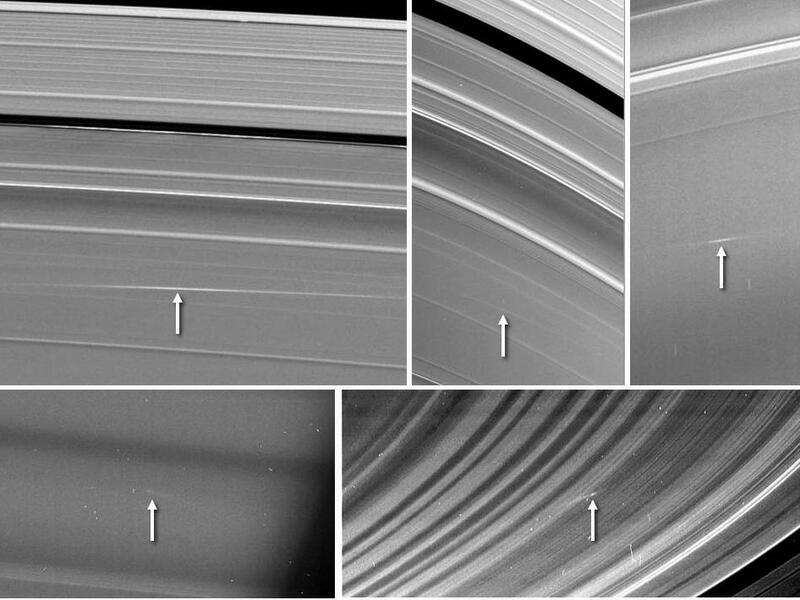 The very shallow sun angle on the rings caused the clouds of debris to look bright against the darkened rings in pictures from Cassini’s imaging science subsystem. Tiscareno and his colleagues now think meteoroids of this size probably break up on a first encounter with the rings, creating smaller, slower pieces that then enter into orbit around Saturn. The impact into the rings of these secondary meteoroid bits kicks up the clouds. The tiny particles forming these clouds have a range of orbital speeds around Saturn. The clouds they form soon are pulled into diagonal, extended bright streaks. Previous Post What would it look like to watch Daphnis fly past?